Sir Ben Ainslie will front a new £110million British America’s Cup challenge called INEOS TEAM UK. 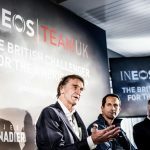 Ainslie will be heavily involved in INEOS TEAM UK — not only will he skipper the boat and act as team principal, but he will also head up the design and build phase of this three-year project, which will culminate in the 2021 Auckland showdown with the Defender, Emirates Team New Zealand. Four-time America’s Cup winner Grant Simmer will also play a major role as CEO of INEOS TEAM UK.. Other key appointments include tactician Giles Scott and Emirates Team New Zealand veteran Nick Holroyd, who will take on the role of chief designer. In accordance with the AC75 class rule, which was published earlier this month, all teams will race on 22.8 metre foiling monohulls, as opposed to the foiling catamarans that have been used in the last two editions of the America’s Cup.